FULL marks to Wimborne Drama for a faultless summer evening’s entertainment, bringing a classic Oscar Wilde play to life. 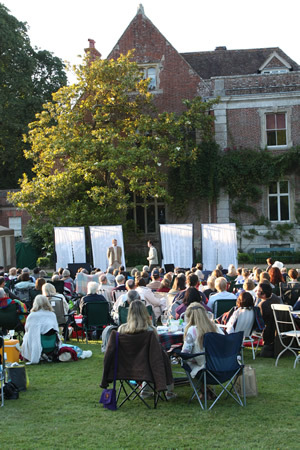 The audience arrived early to take full advantage of the picturesque Deans Court setting to arrange their deck chairs, picnic blankets and tuck into picnics – possibly including cucumber sandwiches and muffins so often referred to on stage. Each actor performed their role in this light comedy of errors with aplomb. 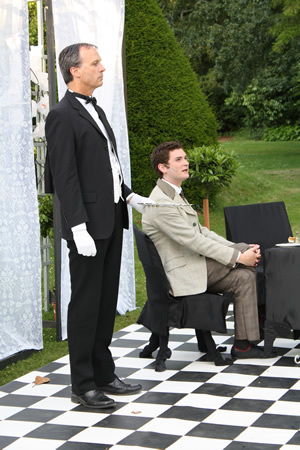 The two male leads, Jack Worthing and Algernon Moncrieff, were perfect as the dandies who both claim be called “Ernest”, sparking much confusion. 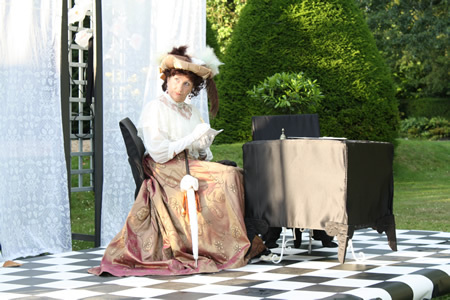 Lady Bracknell’s withering observations on life and society had spot-on delivery, and the whole show sparkled – right down to the servants’ amusing set changes. As dusk neared, and the breeze rustled leaves high up in the historic estate’s trees, we were transported back to the late Victorian era, chuckling away as they haplessly create a silly mess. This opening gala performance, the first of three sold-out dates, raised £1,000 for Julia’s House hospice. 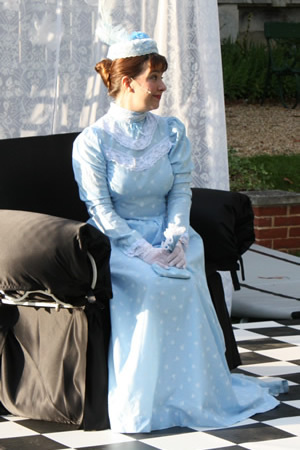 It was Wimborne Drama’s first outdoor performance, and hopefully the first of many. 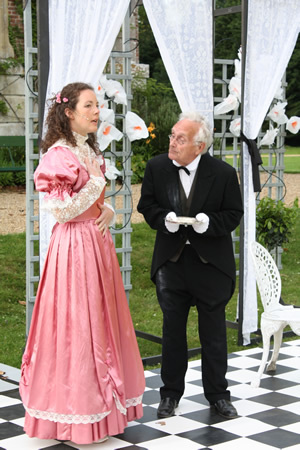 HAVING made the decision to perform Oscar Wilde’s delightful ‘improbable comedy’ in the open air, members of Wimborne Drama must have spent the last few weeks praying that the weather would be kind. It certainly was on opening night, and if it felt a tad chilly when the sun went down – well, isn’t being swathed in blankets the latest look? I should add that I’m referring to the audience at this point, not the actors, all of whom looked as elegant as one would expect. I love this gloriously witty play so I would almost certainly have enjoyed myself anyway, but the combination of the weather, the beautiful Deans Court setting and the gorgeous Palm Court orchestra type music that was played over the speakers as we tucked into our pre-show picnics, not to mention a first-rate production, made for what I can only describe as a perfect evening. That perfection began very early on, with an extremely efficient front-of-house team checking tickets and directing everyone into the parking area, and it ended as we left, with flaming torches lighting our way out of the grounds. Those small details may seem trivial, but they can, and did, make a huge difference. Full marks too for an excellent, beautifully designed programme – I loved the cover, showing a gloved hand proffering a cucumber sandwich, with crusts removed of course. 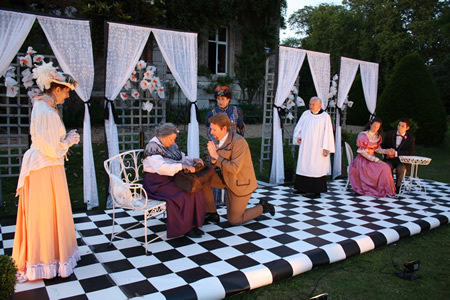 The black and white set was striking, and its transition from London flat to country garden well deserved the round of applause it received, while costumes were also glorious. Director Paul Dodman chose his cast well, and was rewarded with excellent performances. 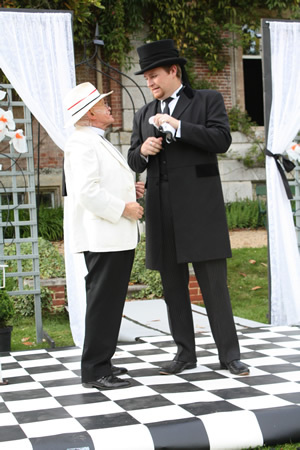 Rob Cording and Mark Everitt sparked beautifully off each other as Algernon Moncrieff and John Worthing, both of whom totally commanded the stage. There were delightful performances too from Tracey Nicholls (Gwendolen Fairfax) and Jenn Singleton (Cecily Cardew), and Val Mantle’s Lady Bracknell was wonderfully imperious. 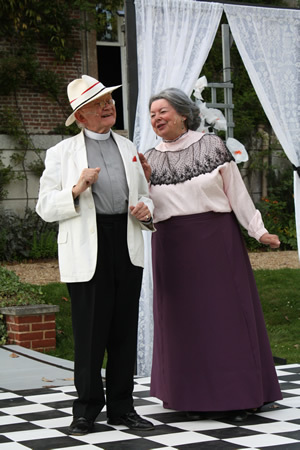 Michael Smith’s Canon Chasuble was a splendid, vibrant character, Jan Stevenson was a lovely Miss Prism and Paul Hewitt and David Pile made the most of their small roles as manservant Lane and butler Merriman. I must also mention the costumed servants - Jackson Ellen, Judy Garrett, Carolyn Hewitt, Verena Smith and Steve Symonds – who made such a splendid job of scene changing. The opening night was a gala performance in aid of Julia’s House, and during the interval a cheque for £1000 was presented to the charity – a splendid achievement. I would recommend that you rush to book tickets for this top-notch production, which runs until Saturday, but I’m afraid you’re too late as it is completely sold out. WIMBORNE Drama will be 80 years old next year *, and the celebrations have already started with the company's first ever open air production. 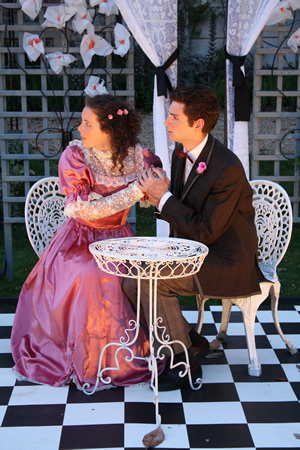 Director Paul Dodman chose Oscar Wilde's perennially popular comedy The Importance of Being Earnest for the beautiful setting of Deans Court, where the sell-out show played last week from Thursday to Saturday. 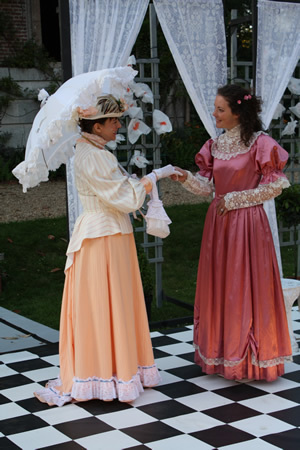 From the very stylish programme, with its green cucumber sandwiches, to the attention paid to vocal styles and costume, this was a show designed to delight the audience, many of whom took the chance to picnic on the lawns in front of the Hanham family home. When a play is as well known as this one, it's easy to fall into the trap of mimicking the mannerisms of the best known actors – there is hardly a more familiar theatrical sound than that of Edith Evans exclaiming "A HANDBAG" when she's told of Mr Worthing's parenthood. Val Mantle's Lady Bracknell avoided the temptation, turning in a memorable performance as the imperious old trout. Company regular Rob Cording was an outstanding Algernon, capturing all the boyish charm and petulant selfishness of the character, and Michael Smith's wonderfully doddering academic Canon Chausble was a joy. All the nine characters were equipped with radio microphones, so there was no problem about vocal projection, but there seemed to be some concern to catch the available light, and it sometimes led to a rather rushed delivery with little opportunity for variation in speed and tone. 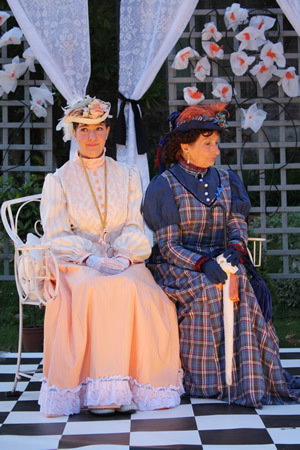 The contrast between the urbane Miss Gwendolen Fairfax and the simple country girl Miss Cecily Cardew (Tracey Nicholls and Jenn Singleton) might have been more strongly emphasised. 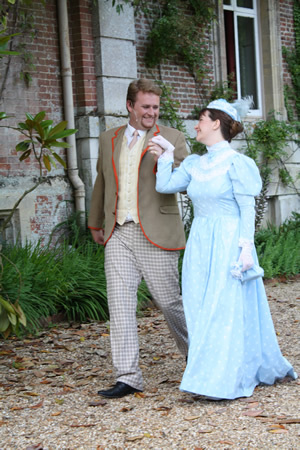 Mark Everitt was the man who was Earnest in town and John in the country - a duplicity he soon regretted. Lane the world weary manservant and Merriman the very ancient butler were played with relish by Paul Hewitt and David Pile. And Jan Stevenson was the unfortunate Miss Prism, the woman who mistook a manuscript of a self penned novel for a baby, and started the whole story rolling. The first night of the show raised more than £1,000 for Julia's House, presented at the interval. And the packed audience on the lawns of Deans Court obviously enjoyed every moment of the company's first alfresco show. * Actually we celebrated our 80th in 2008 ! !